Tonight, the national late model dirt series rolls into the Midwest for the first time in 2018. Tri-City Speedway hosts the LOLMDS on the semi-banked 3/8-mile dirt track in Pontoon Beach, Illinois. 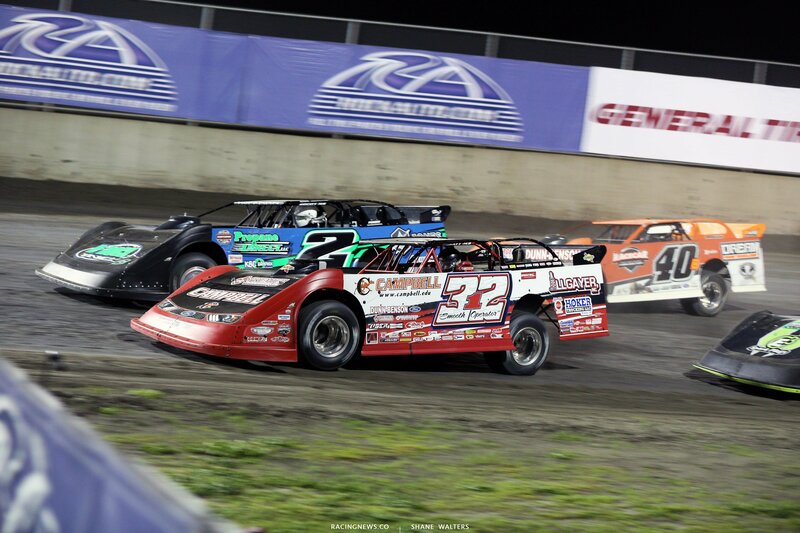 View full Tri-City Speedway race results below. They watered the top of the race track just ahead of qualifying. Just a light sprinkle. Bobby Pierce to the top of the board in qualifying! Pierce is driving for Dunn-Benson Motorsports in 2018. That’s his first Lucas Oil Late Model Dirt Series pole this season. 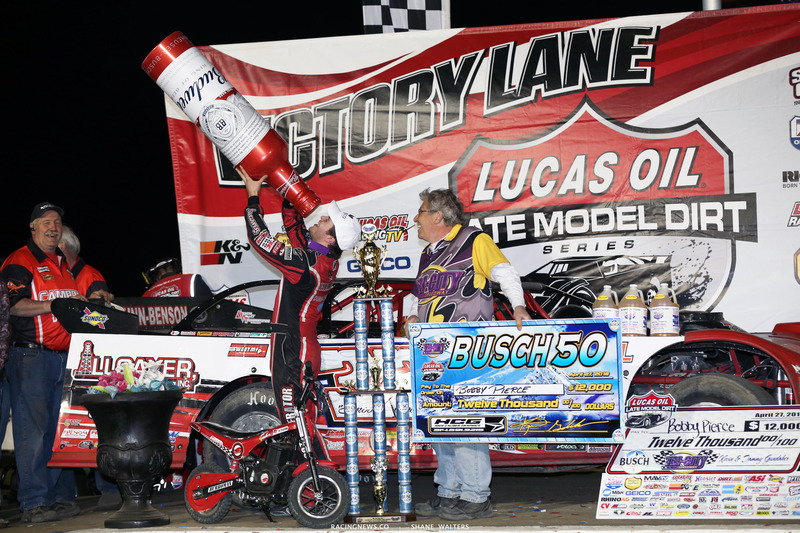 He did it in his home area, circling Tri-City Speedway at 14.810 seconds. Scott Bloomquist was fastest in Group B with a 15.305. Bobby Pierce and Josh Richards set row 1 in the first heat race of the night. Green, Pierce gets the jump. He slides from the bottom to the top in turn 1, on the gas and gone. Pierce opens up a gap of 4 plus car lengths to Richards. Shannon Babb is clicking around the top in turn 1-2 to try and make the transfer position. Babb comes up short of the transfer. Bobby Pierce wins heat race number one. 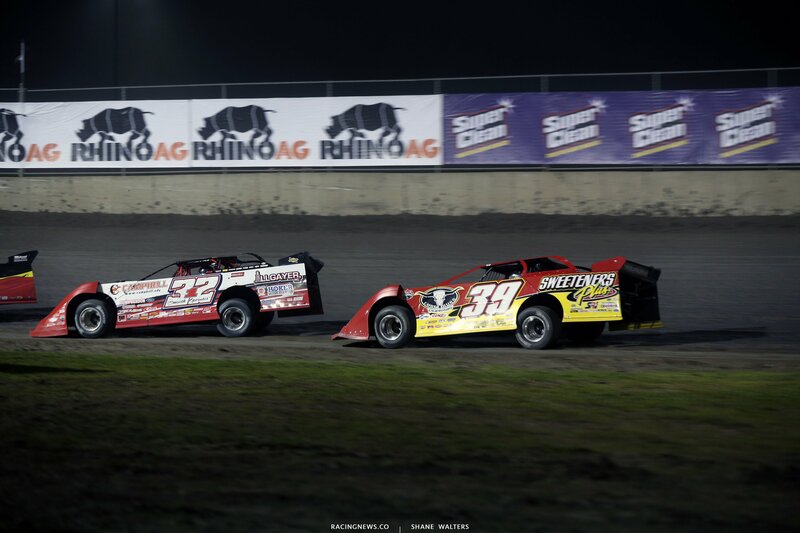 Jimmy Owens and Mason Zeigler trail the pace truck in heat race number two. Green, Owens noses ahead at the start but Zeigler is still there, even into turn 1. Owens checks up in turn 3, he’s off throttle and collecting the car. I think he overshot the corner and got into the slick part. Zeigler is on the gas around the top. Zeigler confirms the lead off turn 4. Owens fights back on the bottom. It’s not enough as Zeigler drives away. 1 to go, Zeigler loops it on his own in turn 3! He only had 1 corner to go! The caution is out. Wow! Green, Jimmy Owens takes the green, he cruises to the win. Scott Bloomquist and Nick Hoffman will lead them to the green in heat 3. 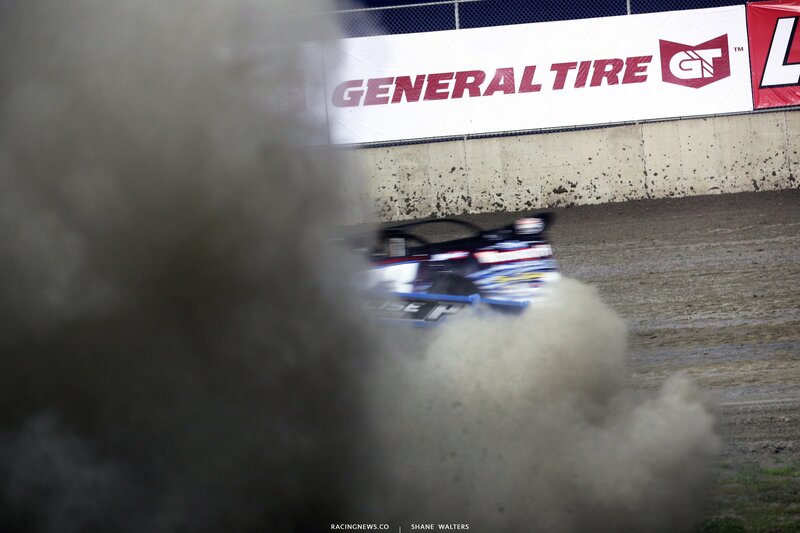 Green, Bloomquist drives to the bottom and slides to the top in turn 1. He did that right across the nose of Hoffman. They had iff turn 2 bumper to bumper. Lap 2, spin at the back. Caution. Green, Bloomquist leads into turn 1. He gets high against the wall and scrapes the barrier in turn 3! Hoffman closes, fast. Bloomquist had opened the gap back up. But, Hoffman is closing once more. 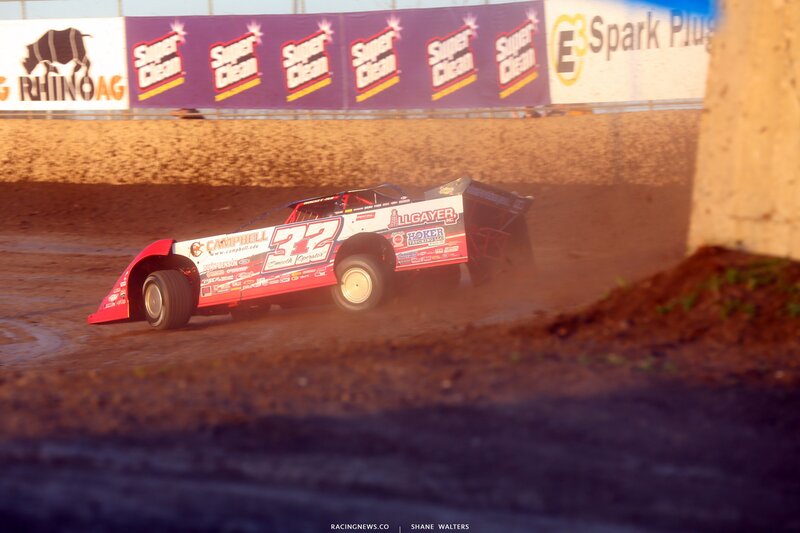 Bloomquist scrapes the wall again in turn 3 as Hoffman looks low. Bloomquist stomps the pedal harder off turn 2 on the next lap. They run side by side off turn 2. It’s a race to the bottom. Hoffman has a nose under there, not enough to force Bloomquist up a lane. 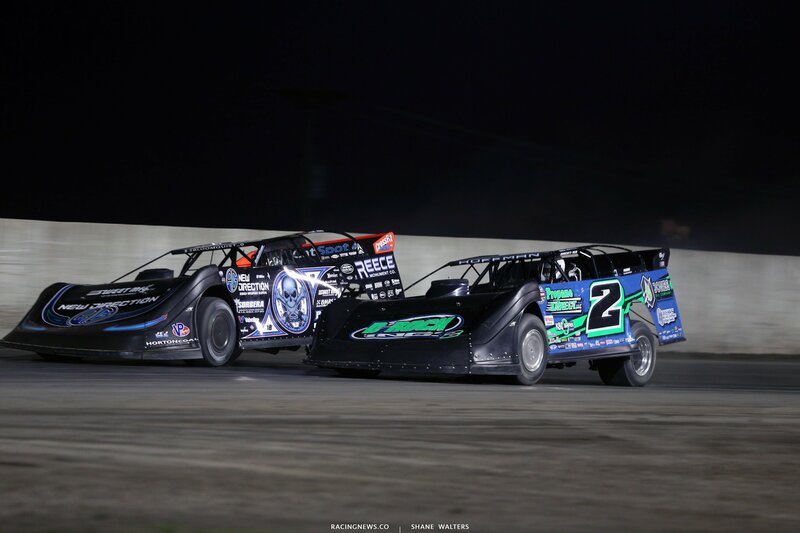 Bloomquist cuts it to the bottom as they fight for space. They come back around with two to go, this time Hoffman drives it deeper into turn 3. He takes the bottom lane away and Bloomquist is forced to run through the slick. Hoffman gets the drive off. Coming to the white, Hoffman leads at the line as the fans stand at their feet. Hoffman wins heat race number three. Kyle Bronson and Tim McCreadie set the front row in the final heat race of the night. Green, they run side by side in turn 1. McCreadie gets into the wall in turn 2! It’s a light scrape, the top is slick. It’s enough for Bronson to slip by and claim the top spot. Lap 5, Bronson had a 6 car length lead but that’s closing again. McCreadie is lifting 15 feet later in turn 3. But, they both run the bottom. Lap 9, the gap was closing but it’s not maintained at 2-3 car lengths. Bronson cruises to win the final heat race of the night! Hudson O’Neal and Earl Pearson Jr run side by side at the start of B Main #1. However, O’Neal prevails on the bottom. As Pearson remains glued to the rim, Hackenast Jr is chipping away at it on the bottom. As soon as Heckenast pulled even into turn 1, Pearson finds a new gear. Pearson begins running down the leader! Inch by inch, Pearson is making the top work. 1 lap to go, Pearson is there, he ran him down from 10 car lengths. He looks high in turn 3, he’s at the right rear. Hudson O’Neal leaves him a lane on the top. They run side by side down the front straight. Hudson takes the win by a nose! Gordy Gundaker leads into turn 1. Tanner English makes it 3 wide for third, he picks up several positions through the middle, move English to 3rd. Vandenbergh grabs the lead from Gundaker. He begins to drive away as Gundaker fades. English has found speed at the top, he clicks around the outside of Gundaker and takes over 2nd. Vandenbergh wins by 20 car lengths. Bobby Pierce and Nick Hoffman will lead the field to the start. Bloomquist will start at the tail due to a new left rear tire. 4 wide salute for the crowd and we’re going racing on a windy night in Illinois. Green, they’re even at the line. Even through turn 1 and even through turn 3. Pierce noses ahead on the bottom. Lap 3, Pierce leads by 4 car lengths. Lap 4, Manville is around in turn 3! He’s parked at the top if the track. English comes into the scene with nowhere to go. Several are collected including Hudson O’Neal. Green, Pierce gets the jump. By lap 10, he leads by 15 car lengths. Lap 15, Pierce is deep in lap traffic. He cant find a way by Satterlee. Pierce, Bronson, McCreadie and Owens have all stacked up nose to tail around the bottom. 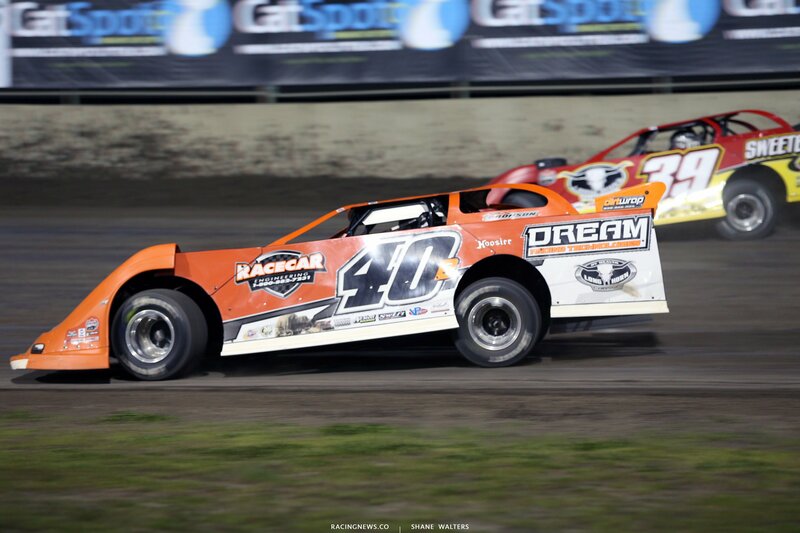 Brian Shirley is looking to add another car to the nose to tail battle at the front. Lap 30, They’re still behind Satterlee. Pierce starts putting the bumper to Satterlee down the back stretch. McCreadie is around Bronson for 2nd. Bronson tried to move off the bottom and make something work, instead he falls to 4th. McCreadie’s closing on the leader. Pierce doors Satterlee in turn 1, he’s through. 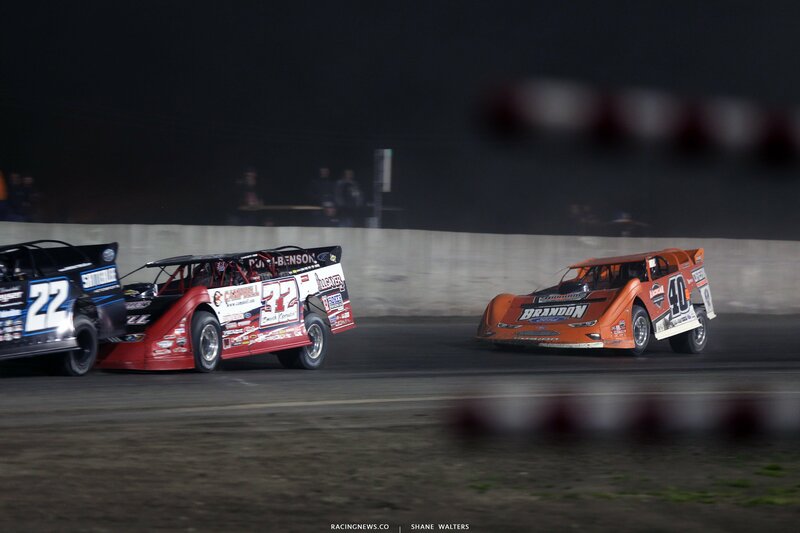 Pierce opens a gap of 3 car lengths to McCreadie. Lap 38, Pierce has caught the tail of the field, again. McCreadie closes to his rear bumper. The accordion has compressed once again. The field is still glued to the bottom. McCreadie is all over the rear bumper but there’s no lane to get by. 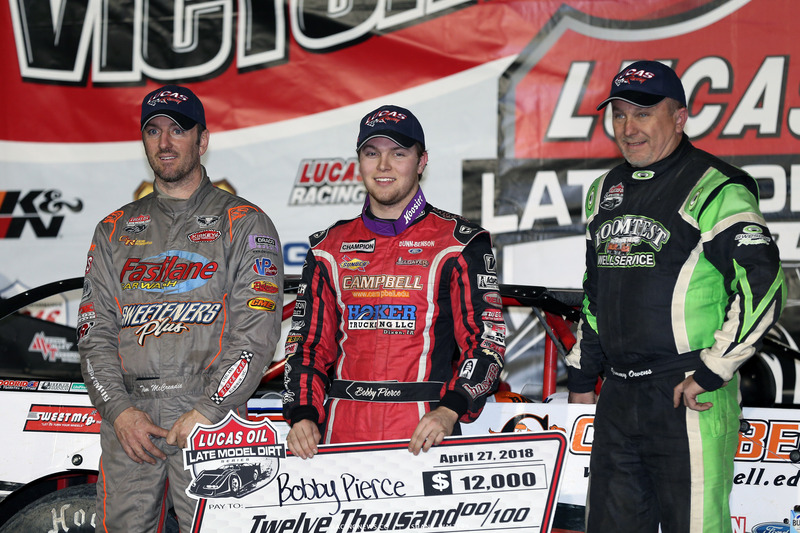 Bobby Pierce wins at Tri-City Speedway! View full Tri-City Speedway results below. Tomorrow night, they’ll rack ’em again at another Midwest bullring. 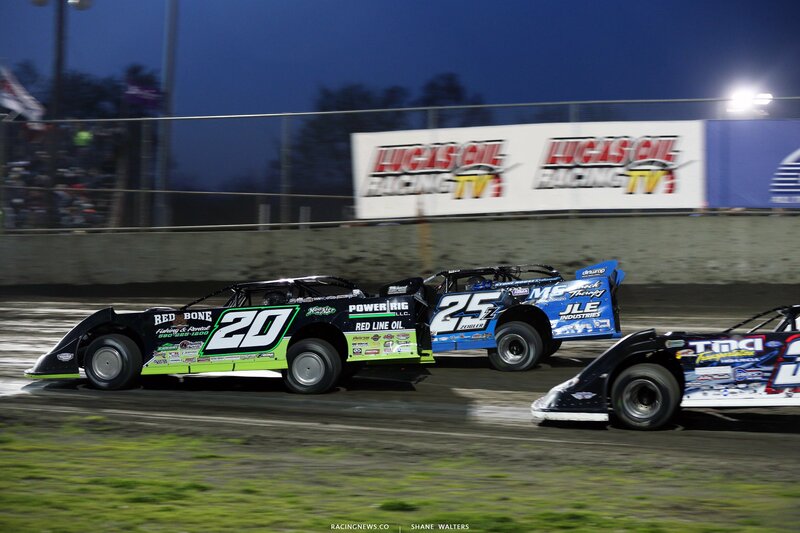 Macon Speedway will host the national late model series on a Saturday night in Macon, IL. Allstar Performance Power Move of the Race: Frank Heckenast Jr.